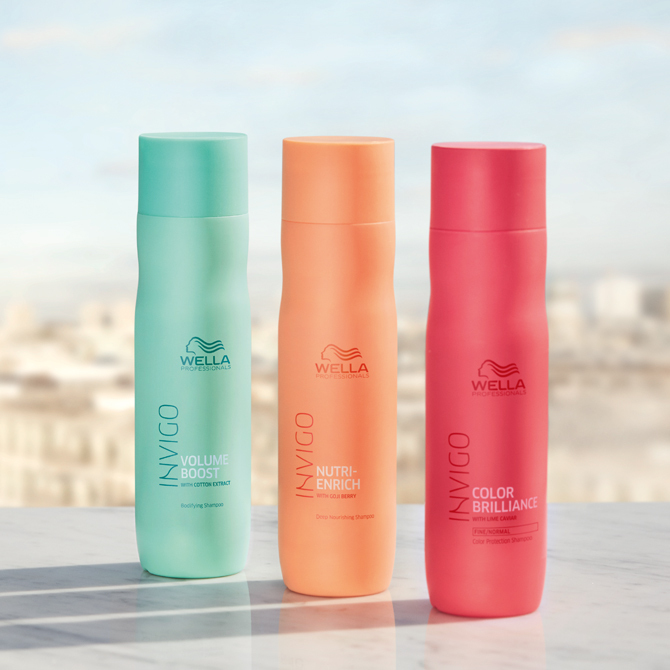 Discover the perfect addition to your self-care regimen with new INVIGO, bringing together salon-quality haircare with spa-like indulgence for ultimate relaxation. From high-performance ingredients to luxurious formulas, find products tailored to your hair type from six different ranges. Hair wash night needn’t be a chore; start your pampering session with a luxurious shampoo head massage – no salon appointment needed. Massage INVIGO Refresh Wash Revitalizing Shampoo into the scalp using your fingertips, concentrating on the back of the head to release tension. Continue to massage around the hairline, moving around the sides of the head to recreate our in-salon Acupoint massage, working into hair lengths before rinsing clean. Then, smooth the nourishing Nutri-Enrich Deep Nourishing Conditioner, or Color Brilliance Vibrant Color Conditioner for colored hair, from mid-lengths to ends, rinsing thoroughly to finish. There’s nothing more relaxing than sinking into a hot bath after a long day. Ease away tension and stress with a soothing citrus bath; fill up the tub with hot water and add a few slices of lemon, letting the citrus scent fill the room. The acidity from the lemon helps to remove dead skin cells, draw out toxins and relieve stress with the mood-boosting scent, leaving you with a healthy glow and a balanced mind. While you soak the tub, apply INVIGO Nutri-Enrich Deep Nourishing Mask to clean, damp hair, lightly massaging into the scalp. For the most effective treatment, towel dry hair first before applying the mask, so the ingredients are able to penetrate hair more easily. Tie into a bun to let the mask’s deeply moisturising ingredients work into each strand. Rinse thoroughly before blasting with cool water, sealing the hair cuticle and adding extra shine. For extra lift pre-blow dry, apply INVIGO Volume Boost Bodifying Foam onto towel-dried hair, concentrating on roots for a soft, bouncy finish once dry. If your tresses need a little conditioning, work Nutri-Enrich Wonder Balm through mid-lengths and ends. The formula will melt into hair, leaving your locks smooth, shiny and manageable after drying. Research has linked the bright blue light from screens to speeding up the ageing process, adding fine lines and wrinkles to the skin. Combat your daily smart phone, laptop and tablet usage with a soothing face mask, to leave skin feeling silky soft and glowing in minutes. Apply to clean skin and curl up with a good book on the sofa while your mask works its magic. Plan for next week’s Wellness Wednesday treat with a trip to the salon. Ask your stylist for a bespoke INVIGO treatment, tailored to your hair’s needs. Go for a 10 minute BOOST, 15 minute RECHARGE or 20 minute RECOVER to kick start your hair back to health with a nourishing, invigorating treatment to suit your hair type. Sit back and relax as your stylist performs a special Acupoint massage, developed to relax and revitalize by focusing on pressure points. Add one of our new INVIGO Boosters to the treatment, too, to add volume or repair lost amino acids in your hair, depending on your needs. Your hairdresser will also recommend a haircare regimen to suit your hair type, so you can continue your salon treatment at home.